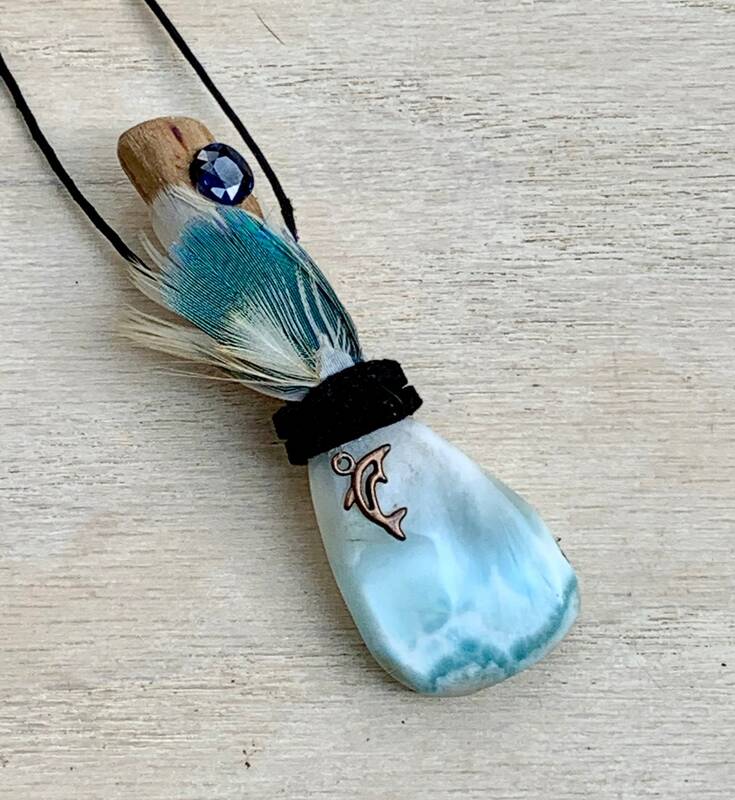 Assists with Releasing Self Sabotage, Guilt, Fear & Emotional Trauma; Aids with Psychic & Spiritual Development; Fosters Intuition, Connection to Higher Realms & Wisdom; Encourages Serenity, Clear Communication, Courage, Balance, Harmony, Grounded-ness & Joy. 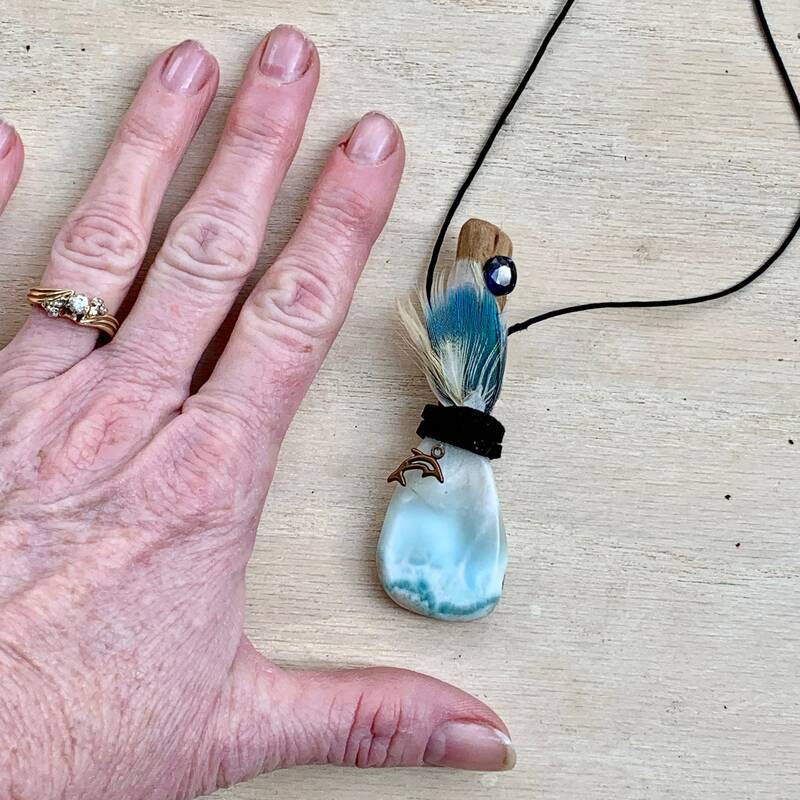 Dog Wood – connected to the Christ energies; signifies beauty and being of service; there is an element of grace, and a peeling out of harmony reminding you even though it may not be mighty in stature, it possesses ancient secrets and wisdom. Larimar – embodies the tranquil Sea and Sky energies yet was born of Fire. 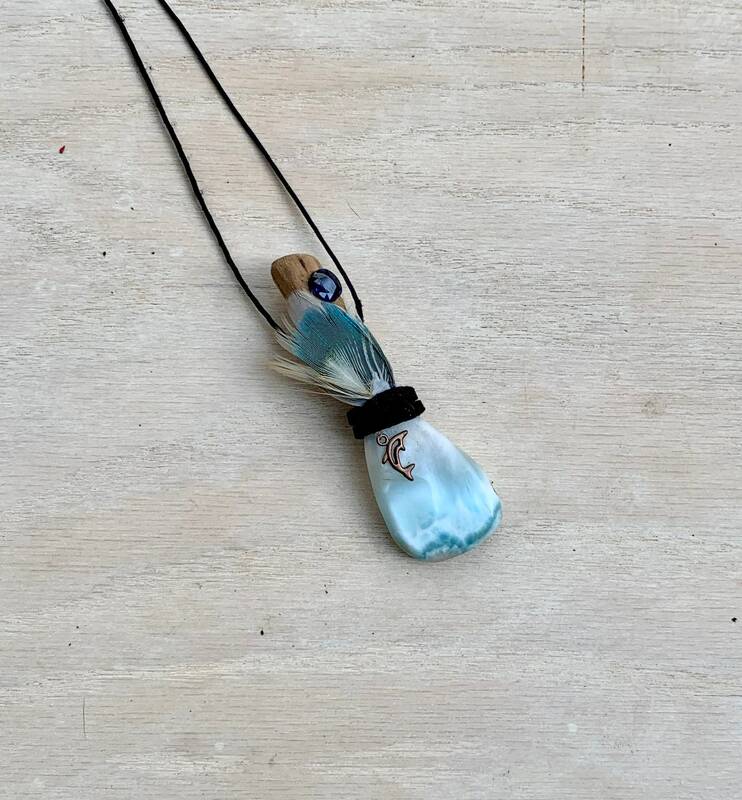 Brings the ancient wisdom of Atlantis and the healing power of dolphins to harmonize the body and soul. Powerful connection to the Divine Feminine. Is helpful in releasing emotional bonds, patterns and what no longer serves. It is particularly helpful with removing guilt and fear and healing trauma to the heart. Removes self-imposed blockages, dissolves self-sabotaging behavior, especially a tendency toward martyrdom.. Is a stone of serenity, promoting relaxation. A crystal of the throat chakra and unleashes the voice of one’s deepest wisdom. Stone of clear communication, provides strength and courage to speak openly from the heart. Spiritually empowering. Sapphire - a stone of intuition and meditation. Using a sapphire during meditation can enhance ones innate intuition and bring to light all manner of creative expression that can be locked within the self. In this, sapphire is excellent not only for Light workers but also for artists and other creatives. Sapphire is used to bring joy, peace, and beauty through meditation into this plane. It can bring fulfillment of dreams and prosperity. Beneficial for mental clarity. It lessens confusion and shows the way to hope. A very protective stone. 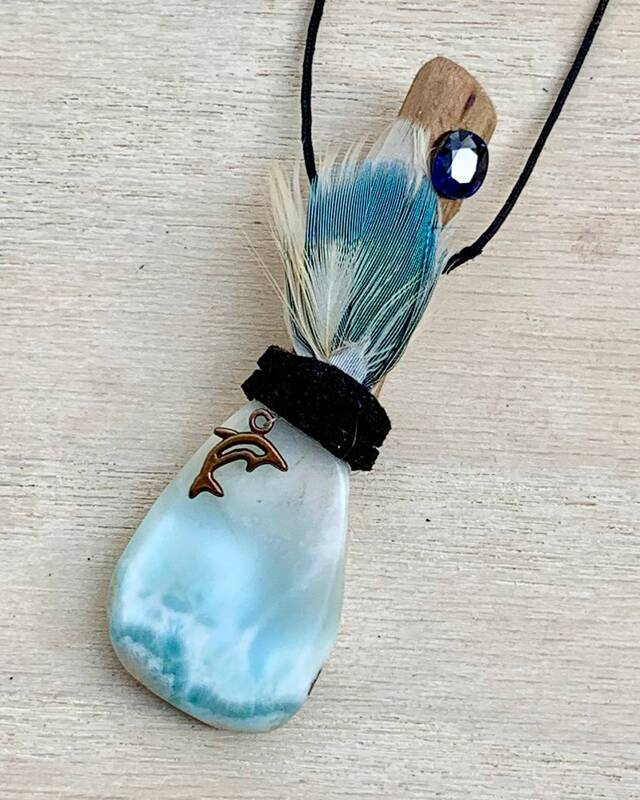 Copper Dolphin Medicine - The dolphin spirit animal represents harmony and balance. Dolphins are both highly intelligent and closely in tune with their instincts, striking a balance between the two states. Dolphins are also a symbol of protection and of resurrection. Their playful nature is a reminder that everyone needs to approach life with humor and joy. People who identify with the dolphin totem are usually peaceful and gentle, but with a deep inner strength. Copper - is an excellent conductor of energy, from electricity to the mystical subtle energies emanating from higher planes, etc. 3.5 inches long; Larimar 1.5 inches.